If you enjoy interacting with people who are just a tick off of the homogenous type our cookie-cutter world seems to turn out, you'll find that aviation is the mother lode of really interesting characters. Our industry seems to attract the person who is off a half beat or so, in marching to the drum that society thumps for all of us. Through the years I've met many of these flying mavericks, and while my experience with them wasn't always a wonderful thing at the time, it was never boring and I look back with a certain fondness to almost all of them. One that comes readily to mind is Dwight. Dwight D. was an unforgettable and unwashed escapee from a John Steinbeck novel and one of the first local pilots I met when I came to the almost deserted little airport in Buckhannon in 1968. Buckhannon became home for my flying school by default in a way, when I was declared persona non grata at the Clarksburg Airport, where I had been instructing flying students. This banishment came about when the owner of the airport's existing flight school, who conveniently was also the airport manager, one morning took off his flight school hat, put on his airport manager hat and wrote me a letter on official airport letterhead asking me to cease and desist my instructing activities. 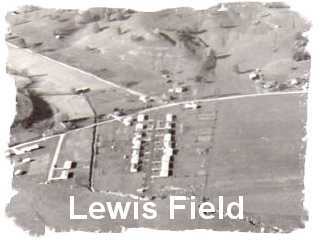 Looking back, my ejection from the big airport was a Godsend since it caused me to find Lewis Field. This little airport proved to be the perfect place at the perfect time for what I wanted to do, which was to build a flight school. It had been a Civilian Pilot Training base during the war and it boasted a 60- x 60-foot hangar in good condition and also second small shop hangar. The runway was 1,600 feet of well-established sod and it sat in a broad valley just west of the town, surrounded by farmland. After the war, a successful flight school operated there and trained dozens of GI Bill students. The late 40s found it a very busy place, with scores of pilots flying from there and many aircraft calling the field home base. Airshows and hangar dances occurred regularly and the airport came to contain a life and a spirit of its own that can only occur where people who genuinely love airplanes and flying come together. When the post war aviation bubble burst and the GI Bill ended, student flying almost stopped and aviation sputtered at airports all over America. Sadly, Lewis Field was no exception. When I arrived in the winter of 1968 the FBO had been shuttered for a dozen years and a cold and lonely February wind blew through a hangar holding three airplanes. Just a Cessna 182 that I knew was owned by the town's colorful Dodge dealer, a Super Cub owned by the Civil Air Patrol and a beautiful Luscombe owned by Dwight D., whom we were soon to know, squatted in the dim confines of the hangar. I made arrangements with the farmer who owned the airport to rent hangar space for my airplane and office space for me. With the help of friends, we began working on the office and throwing out the detritus of many years. Nothing is surer to accumulate junk than a dry and empty place where you can "temporally" store things that you haven't gotten around to throwing away yet. The airport office had apparently been ideal for such use because there was tons of the stuff. It was a lean-to connected to the hangar and, before being abandoned, it had once been a fine facility. Over a period of several weeks we installed windows, got the bathrooms working, installed a new ceiling and a heating stove and got ready to open the school. One day, about the time we opened the doors of our new flight school, Dwight drove into our lives, nosing into our parking lot in the 1937 Plymouth Coupe that he had purchased new and that, he would tell me later, he equipped with every option he would ever want, including a radio, heater and dual horns. Dwight was a bachelor of the hard-core and unrepentant variety and at the time of this story was probably in his mid sixties. But the solitary life had stamped his appearance with another ten or fifteen years, and without a doubt he could have passed for late seventies. He had retired from running a successful auto glass shop and he lived alone in a nearby town, still in the same two-story house that he grew up in and which his parents had left him. I am certain those good people would have rolled over in their graves could they have seen the house now, since it was stacked from floor to ceiling with things Dwight was saving. He was a hoarder, and only a narrow path was available to get from room to room. No doubt Dwight washed his face and hands, but I'm much less sure he ever took a bath. In fact I'm pretty sure that if he did it was of the seasonal variety, but one of the things that made me doubt even this was his annual "Airing of the Pits." This ritual occurred each spring when the weather had warmed and he had made his seasonal change to a short sleeve shirt with rather loose fitting sleeves. He would carefully pick a day with a good breeze blowing, then align himself properly with the prevailing wind, and holding his arms straight out from his sides, let the wind blow up his shirt sleeve. He would turn from time to time to give each side an equal flushing, and stand smiling, arms outstretched like a welcoming statue, doing a strange little back and forth rotation of his hands as the breeze blew away the darkness of the winter past. Dwight was working on replacing a cylinder on the engine of the Luscombe when I first met him. He would arrive with his tool kit, a stool and a drop light and work calmly in the dark confines of the hangar, his ever present plug of chewing tobacco in his jaw. It seemed to take an age before the new cylinder was in place and the airplane was ready to fly and by the time he had it all screwed back together it was Spring. Dwight approached me one day and asked if I would give him some dual instruction in the Champ. Apparently the Luscombe had been grounded for some time and he felt his flying skills needed to be tuned up a bit before flying his airplane. I agreed to fly with him. With Dwight installed in the front seat of the Champ, I showed him where all the controls were and climbed in the back. Someone twisted our prop and we began to taxi down the long grassy taxiway to the runway. I had always required my students to taxi the tail draggers "no faster than you can walk" to preclude taxi accidents, but Dwight had the throttle well up and we were proceeding faster than a good man could run. I pulled the throttle back and asked him not to taxi so fast. A second time the throttle went forward and our speed increased, so I repeated reducing the throttle and asking for a slow taxi. Once more the throttle went forward; Dwight then turned his head and addressed me. "**** you, I'll taxi as fast as I want to." Somehow, this not only didn't offend me, it hit me as one of the funniest things that had happened to me as an instructor, and from that moment on I considered that this flight was not about teaching and that my only function today was just to make sure my airplane didn't crash. I needn't have worried about this, for once off the ground Dwight flew with a smoothly coordinated touch. Needless to say, his pattern around the airstrip bore no resemblance to the one that we taught, but he got us out to the practice area, through some stalls and back on the ground in fine form. I told him that as far as I could see he should be good to go in the Luscombe and that same day he wheeled it out of the hangar and started flying it. That summer Dwight and the Silver Luscombe became regulars in the sky around Lewis Field. On pretty days he'd arrive in the Plymouth and pull the airplane out of the hangar and spend the day tinkering on the airplane and making several local flights. He also made several cross-country flights, some of them overnight and one of them as far as Detroit he said. Esso road maps were his navigational aids, for Dwight's travel in the airplane was the same as it was in his Plymouth. He followed the roads, and this seemed to work well enough, for he always made it back. So far as I knew Dwight had only a Student License and since I had not endorsed him for solo and certainly not for cross-country, he was flying under the FAA radar. One Saturday in September Dwight returned from a local flight and taxied up to the hangar even a little faster than his usual clip. When he alighted from the airplane I was horrified to see he was covered in what I at first thought was blood, and his face was ashen. As I got closer to him I saw that whatever was covering his face and clothes appeared too dark and too brown to be blood, and I asked him what had happened. With a shaking voice Dwight told me he had hit a wire. He was flying low near his home and hit a major power line which, as it turned out, put the entire town in the dark and the authorities on his tail. The wire had connected with the airplane just under the propeller, missing the turning blades completely and the jolt of the collision had jerked the nose of the airplane down before the wire broke, and Dwight's head had crashed into the skylight, breaking the Plexiglas and giving him a nasty bump on the head. Even worse, his spittoon, which he kept in the place of the right passenger seat, had sprayed violently over the inside of the airplane. Photographed in black and white it would have looked like the battle station of a WWII aircraft that had been hit by flack. Other than a small dent in the nose bowl and the broken skylight, the Luscombe appeared to have come through the ordeal unscathed. Dwight, not so much, since the blue tinted Plexiglas from the skylight was found 'at the scene' and was traced to our airport. I don't know what the FAA did to Dwight, since he had no license for them to take, but I do know the power company came after him with a vengeance. It apparently didn't take all his money though, for several years later when he died and his house was sold, the buyer found $30,000 in cash hidden in the wall while remodeling.